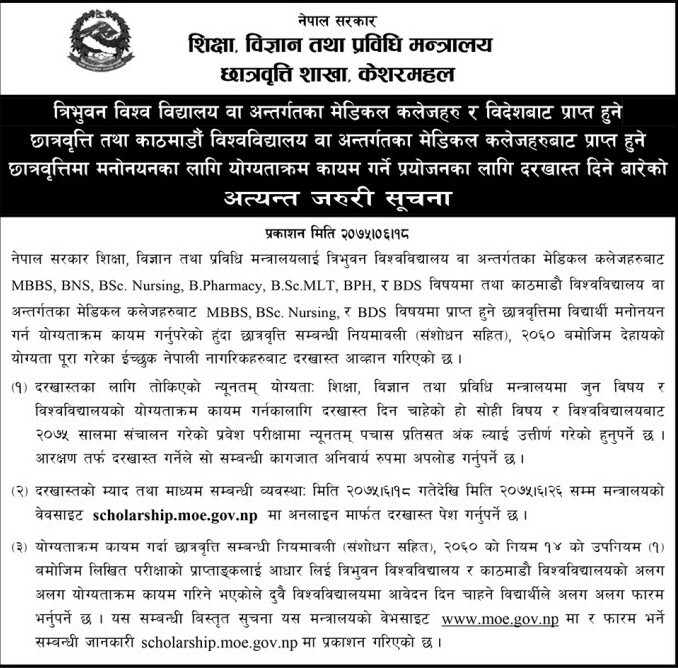 The Ministry of Education, Science and Technology, Scholorship Department, Kesharmal invites applicantion for the scholarship provided by the TU affiliated Medical colleges for MBBS, BNS, BSc. Nursing, B.Pharmacy, B.Sc. MLT, BPH & BDS programs and KU affiliated Medical Colleges for MBBS, BSc. Nursing & BDS Programs. Candidate must fill the application form from Ashwin 18, 2075 to Ashwin 26, 2075.